Advertising has had a stultifying effect on our thinking. So much of it lays claim to independence and enterprising behaviour when it is in fact the exact opposite. We are constantly told to think ” outside the box ” usually when we are being persuaded to spend thousands of pounds on one type of silvery grey wheeled box rather than another. And these boxes usually glide through brightly lit cities at night and end up at some exotic location for skiing or para gliding or mountain trekking. As if having the latest car is all thats required to open up all of these adventures for us, despite the fact that we’ll be working so many hours to paying for our particular overpriced box that we’ll probably never see the outside world again. Many people claim to have original, independent thought, yet behave in an utterly conventional fashion. But I guess its all relative. If you are surrounded by others with narrow, conservative values even the slightest loosening will feel revolutionary. Perhaps these boxes are arranged like Russian dolls, inside each other so someone can think they’ve really transcended their own but be blissfully unaware that they are still contained by many others. Scientists are perhaps more guilty of this kind of behaviour than most. So often they crow about their own use of rational logistical thought while pitying others stuck well and truly within their own paradigms of feeling and belief. If we were to ask them to suspend their patronising view of astrology and tell us which sign they would most like to be identified with, the result would probably be Aquarius for detached clarity of thought and Sagittarius for far sighted exploration. Interesting then that a study of 737 Scientists produces a joint highest scoring of 138 % of the expected figure for Gemini ( for processing vast amounts of information ) and Capricorn ( and operating within a narrow paradigm ). In fact the lowest score by far is for Sagittarius with a mere 57 %. Of course scientists would naturally dismiss these findings as being just pea brained fluff. This, despite the fact that the ” p ” figure for this distribution is 0.0001606. And since anything beneath 0.01 is considered to be statistical proof of a link, we have pretty strong evidence that scientists don’t think outside the box at all. Because everyone has the filter of their own birth chart we all see things subjectively. So to attempt to understand the world out there without first questioning our own box is not scientific. So the only true scientists are those that have experimented on themselves, on their own consciousness and been able to stand back and observe in a detached way whatever happens. It is difficult to say what is consciousness or awareness. People usually talk about it in terms of awareness of a certain thing i.e being politically or sexually aware. But what is consciousness and where would we find it in a birth chart ? In astrology we often talk about awareness of the emerging self at the Ascendant and that of others at the Descendant, so there is a sense that the central horizon line is the plane of consciousness. It is true that many people who have worked extensively in these fields do have the Ascendant / Descendant axis emphasised in their charts. Out of Capricorn Research’s sample of 206 Psychologists, the Sun occurs conjunct the Ascendant in 149 % of the expected number of times and many famous ones including Carl Jung have it closely conjunct the Descendant. Its also interesting that Mercury, the planet most clearly associated with the thought processes occurs conjunct Uranus, the one that is closest to out of the box thinking appears 142 % of the expected number of times for this group. That is compared to the 116 % figure for Scientists in general. One scientist who really did think outside the box and performed his experiments on himself was the man who discovered LSD, Albert Hofmann. Hofmann had Capricorn and Gemini ( the signs most commonly shared by scientists ) heavily featured in his chart. There was also a strong research connection through his Sun being in the 8th and Pluto rising. Both placings indicate someone who wants to explore something deeply and penetratingly. Mercury is conjunct both the Descendant and Uranus and opposes Pluto. You couldn’t really get much more outside the box than that. … affected by a remarkable restlessness, combined with a slight dizziness. At home I lay down and sank into a not unpleasant intoxicated like condition, characterized by an extremely stimulated imagination. In a dreamlike state, with eyes closed (I found the daylight to be unpleasantly glaring), I perceived an uninterrupted stream of fantastic pictures, extraordinary shapes with intense, kaleidoscopic play of colors. After some two hours this condition faded away. Three days later, on 19 April 1943, Hofmann intentionally ingested 250 micrograms of LSD. This day is now known as “Bicycle Day,” because after starting to feel the effects of the drug he rode home on a bike, and that became the first intentional acid trip. Looking at Hofmann’s chart, his Mercury / Ascendant opposition forms a T Square with Saturn in Pisces at the Midheaven. The apex planet always points to the results of the tensions created by the opposition. So we could say that Hofmann’s expansive academic curiosity ( Mercury in Sagittarius opposite a Gemini Ascendant ) helped to create a troubling situation ( Saturn ) where all kinds of unknown things ( in Pisces ) could be unleashed. In fact an apex Saturn in Pisces could symbolise a kind of Pandora’s box. Its also interesting that at the time of his bicycle trip, Neptune the planet that rules intoxicants of all kinds had created a Grand Cross with this T Square, opposite Saturn and square Mercury. 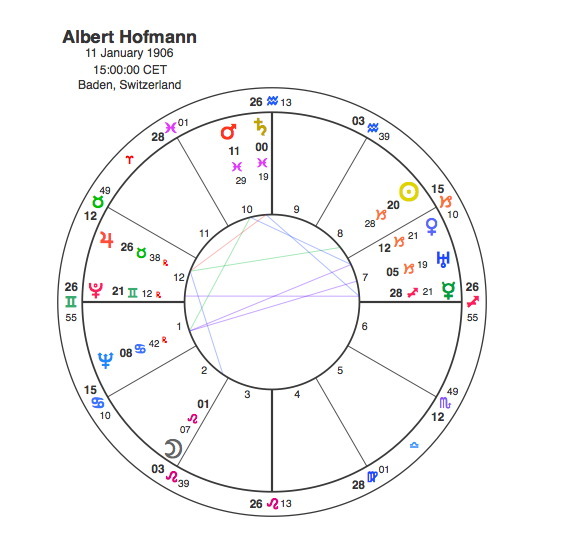 Hofmann’s experiments with LSD did him no harm as he lived past his Pluto half return, and died in 2008 when Pluto was in the T square conjunct Mercury and square Saturn. The role of an astrologer is not to moralise or to impose their own views, it is simply to reflect the themes of someone’s chart in as clear and objective a fashion as possible. Capricorn Research is prepared to admit taking LSD on the odd occasion, strictly for research purposes of course and under properly controlled astrologically selected conditions ( my progressed Sun was conjunct my Ascendant opposite a Jupiter / Uranus conjunction and square to an apex Neptune at the time ). It was part of a helpful series of experiments that enabled me to think outside a triple Capricorn box at the time. Would I recommend it to anyone else ? I guess it depends on how narrow your own box is. There are a few scientists who could do with a little help in these areas. Richard Dawkins, for one, it would help him get in touch with his Moon in Pisces opposite Neptune. But with that aspect I can well understand why wouldn’t want to go there. Pandora’s got nothing on that one.